Nature's Answer alcohol-free extracts are produced using alcohol, water and natural extractants. All alcohol and extractants are then removed through our cold Bio-Chelated proprietary extraction process, yielding a Holistically Balanced standardized extract. Liquid extracts are absorbed faster than tablets or capsules, and are more potent than tinctures. Holistically Balanced guarantees that the constituents of the extract are in the same synergistic ratios as in the plant. Manufactured in our FDA registered and pharmaceutically licensed facility; Unconditionally guaranteed. Suggested Use As a dietary supplement, for short term use (up to 10 days) take 1-2 mL (approx. 28-56 drops) 3 times a day in a small amount of water. Supplement Facts Serving Size: 2 mL (approx. 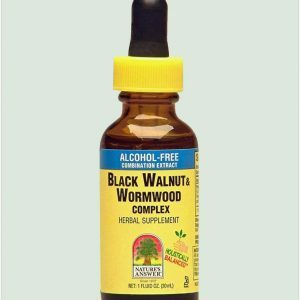 56 drops) Servings Per Container: 15 ount Per Serving %DV Proprietary Blend: Extracts of Black Walnut hulls (1:1), Wormwood leaves and tops (1:1), Sweet Annie leaves and tops (1:1), Clove flowers (1:1) 2,000 mg Daily Value not established. Other Ingredients Vegetable Glycerin and purified water. Warnings Shake well. Keep out of reach of children. Do not use if pregnant or nursing. Do not use if safety seal is damaged or missing. 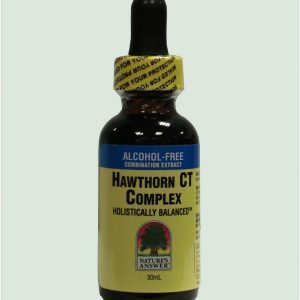 Hawthorn CT Complex Hawthorn, cayenne, and Linden are combined to support and strengthen the cardiovascular and circulatory systems. This potent formula soothes anxiety and stress. 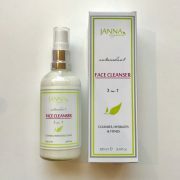 This liquid formula is highly absorbable and alcohol free. Alcohol-Free Fluid Extract (1:1) Silybum marianum Herbal Supplement Promotes Healthy Liver Functions Holistically Balanced Kosher Parve Responsibly Wildcrafted Herb Nature's Answer alcohol-free extracts are produced using alcohol, water and natural extractants. All alcohol and extractants are then removed through our cold Bio-Chelated proprietary extraction process, yielding a Holistically Balanced standardized extract. Liquid extracts are absorbed faster than tablets or capsules and are more potent than tinctures. Holistically Balanced guarantees that the constituents of the extract are in the same synergistic ratios as in the plant. Suggested Use As a dietary supplement take 1-2 mL (approx. 28 - 56 drops) 3 times a day in a small amount of water. Supplement Facts Serving Size: 2 mL (approx. 56 drops) Servings Per Container: 15 Each serving contains: % DV Each Serving Contains: Milk Thistle seed fluid extract (1:1) 2,000 mg Daily Value (DV) not established Other Ingredients Vegetable Glycerin and Purified Water. Warnings Shake well. Keep out of reach of children. Do Not use if pregnant or nursing. Do Not Use if safety seal is damaged or missing. Sealed for your protection.